Taking a positive risk for the means of bettering yourself mentally and or physically. Positive risk for me means experiencing something new that reinforces your ability to thrive in your environment and within yourself. Many of the youth I teach, are considered at risk but I think of them as youth whose potential has not been cultivated or tapped. It only takes a little positive risk to show them the value in themselves and their ability to express their creativity. 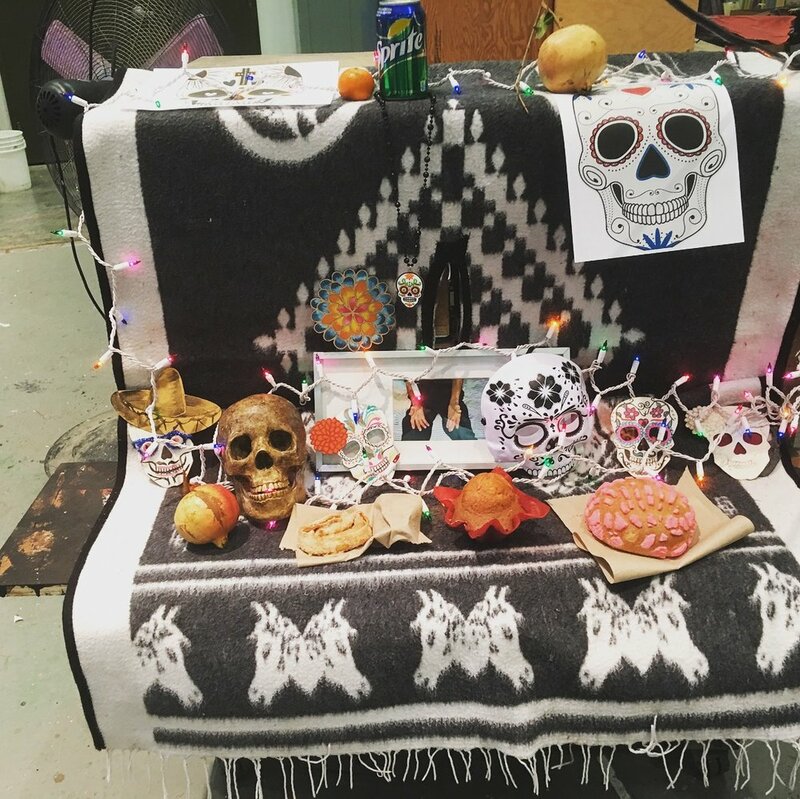 My last workshop took place in Boyle Heights (East Los Angeles, CA) at LPAN and art studio of Fabian DeBora who opened up his space for me to provide my scenic art instruction. I taught to two student groups, one from Homeboy Industries Learning Works Charter School and one form Pasadena Learning Works Charter School. Each student painted 2D bricks on Masonite. I used premixed Off Broadway colors and glaze medium from Rosco. I also added some Rosco Crystal Gel to the paint to create a slight texture for the mortar in between the bricks. The brick stencil allowed students to achieve the brick pattern quickly and easily. Most of the students never painted anything before and it was my intention to allow them to discover and interact with the process of scenic painting at their own pace and comfort level. This specific workshop reflected the importance of the journey, not the destination. My workshops are more than learning how to scenic paint. The purpose of my workshops is to lose the fear that we impose upon ourselves about being creative and expressive through art. I use my scenic art skills and abilities to tap into people’s creative side. Through my workshops I guide individuals to the possibilities of creating simple methods of creating a 2d brick façade, woodgrain, stone or marble etc. My goal is to remove mental barriers through confidence building, listening and patience. I invite individuals to explore and express their piece in the manner that they feel comfortable with. I am deeply grateful for the sponsorship of the Latinx Producers Action Network (LPAN), Rosco and Guild of Scenic Artists. Their sponsorship helps to provide the much needed funding, supplies, materials, social media and moral support. I look forward to providing more workshops and reaching more communities in the near future. I would like to personally thank Sandra Quintana, Fabian DeBora, and Rudy Marquez. The Teachers from both Charter Schools and their students.